I have this in the info of my Riot Grrrls For Life Pro-Life facebook page, and I want this blog to also connect all the pro-life groups that are on these sides and other links relating to that, so I figured I should post them here too. I'll just copy and paste it from there and keep them both updated when I come across new things, and please comment if you know of more. 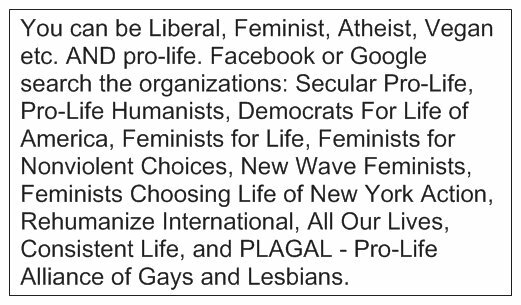 You DON'T have to choose between being a Feminist and being Pro-Life, and that goes for Atheist and Liberal as well. 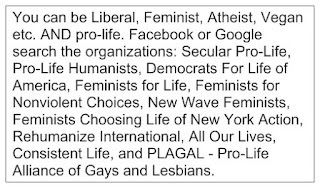 Here are some articles that talk about why Liberals, seculars, and feminists should be the ones to be against abortion, or added into the group, or about pro-life liberalism, feminism, and secularism/the cases against abortion for these sides, or people who are pro-life and these sides. Did I Leave the Left or Did the Left Leave Me? Cheering for Change: A young feminist embraces the pro-life cause. Response to Associated Press Article: "Feminists For Life Chief Rallies Vt. Abortion Foes"
Thank you so much for this list. The fight against what I consider to be a violation of basic human rights is something that I am more than willing to ally with *anyone* with, even if they disagree with me on everything else.